The cruiser class has been split into two proficiencies: expert and sport. When did USA BMX/BMX Canada institute this change, you say? It was Fédération québécoise des sports cyclistes (FQSC), the sanctioning body in Quebec, Canada that made the change. I first heard of this development when I was catching up with Quebec racer, Andrew Mueller, at a race a few weeks back. I was stoked to hear the news. I’ve been thinking about this idea for a while and was always disappointed when it would be raised on BMX racing forums and then quickly dismissed (shot down is a better description) by folks saying “it would be harder to fill gates”, “there are already too many classes”, “go race 20 then”…blah, blah. Turns out these arguments to stick with the status quo are all bunk if the results in Quebec are anything to go by. According to Mueller, more and more riders are entering races and it’s not uncommon to get 2-3 full gates in the “sport’ class alone. Older riders in Quebec are now returning to the sport (or just giving it a try for the first time) because the intimidation factor is significantly lower. They no longer have to gate up immediately with highly experienced/skilled riders that are not afraid to bang bars or hit the big jumps. BMX racing’s appeal and selling proposition was always “nobody has to sit on the bench.” Yet the Cruiser class (in USA BMX/BMX Canada) has always kept some people on the bench by not offering an option to people that are not willing or interested in racing an expert-level class. Kudos to FQSC for making this important move. Looks like it’s really paying off for them. Will USA BMX/BMX Canada have the courage to make a similar change? The August edition of BMX Plus! has an interesting column written by Mike Day about his new prototype Speed Series bike. In the article, Mike talks about his desire to put together “the biggest-wheeled bike that was allowed to race” in the 20- inch class. According to the UCI rule book that meant the diameter of the wheels, including the inflated tires, could not exceed 22 1/2 inches (57 cm). Once he determined the parameters, Mike worked with GT and Tioga, to design a bike that featured a larger-diameter rim and low profile tire. The result? A combined diameter just a 1/8 inch smaller than the maximum size allowed by USA BMX and UCI. Pretty interesting stuff….especially given USA BMX stance that 22″ bikes belong in the cruiser class. Wonder if this will prompt USA BMX or the UCI to make an announcement about this sort of thing…especially if the rumors are true regarding other companies working on their own versions of this. 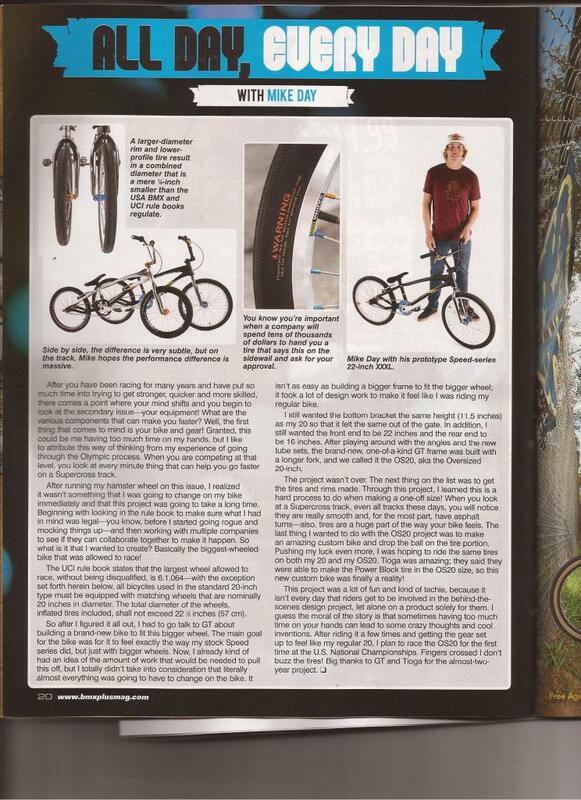 Check out the BMX Plus article for more details. 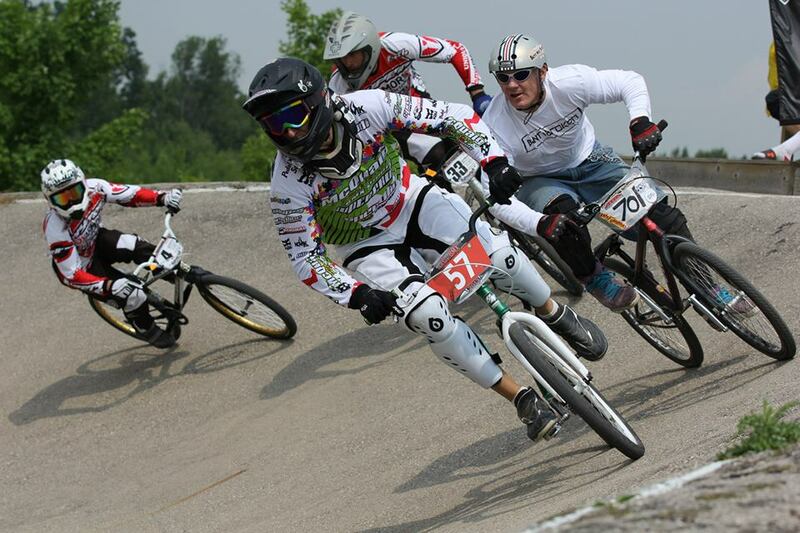 Responding to the growing interest in 22′ bikes, I’ve heard that USA BMX/BMX Canada will now allow 22″ bikes on the racetrack for the 2013 season. But only under strict parameters. Namely, that they can only be used in the cruiser class. Seems like an odd decision. I can’t remember the exact rationale…probably because it didn’t make much sense to me…but it seemed to boil down to the importance of maintain the integrity or sanctity of the 20″ class. But why the rigid adherence to wheel size in the “20 inch class”? In cruiser, we already have 24s, 26s, BMX cruisers, mountain bikes…you name it. Why not a slightly bigger wheel size for your “class” bike? BMX RACING: 22″ wheel BMX first race win in 20″ class Faction Bike Co. from Faction BMX on Vimeo. I would bet that most people considering (or already buying) a 22″ bike are doing so to replace their 20″ and not their 24″. In an era where everything on a modern-day BMX race bike has changed spec-wise…handlebar size, top tube length, materials… there still seems to be a slavish devotion to wheel size. Maybe from here on in, race bikes should just be referred to “class” and “cruiser”…with 22s being part of the “class” segment. 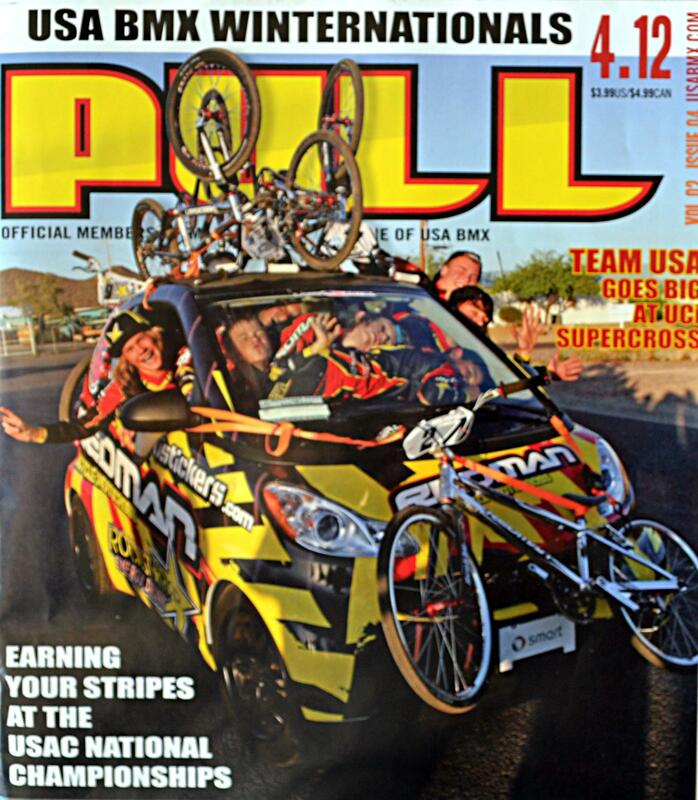 Got the latest issue of Pull magazine from USA BMX today. Pull magazine covers are typically yawners but this month they did something interesting. 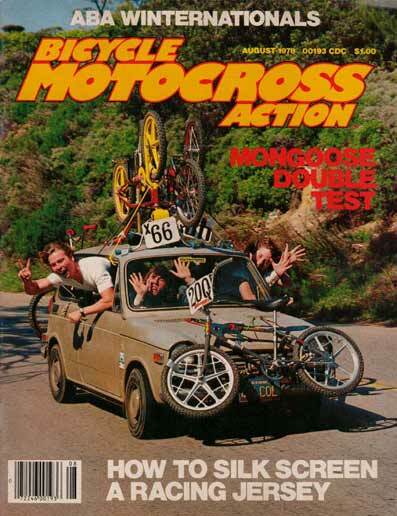 Working with Team Redman, they piled the Redman team into the company car to recreate an iconic 1978 Bicycle Motocross Action magazine cover. If you’re old school and/or a BMX nerd, seeing this cover probably brought back memories of this cover, shot by none other than icon-in-his-own-right Bob “Oz” Osborn. Actually, the whole “flashback” feel seems to (unintentionally…I think) run throughout the rest of the magazine as well. 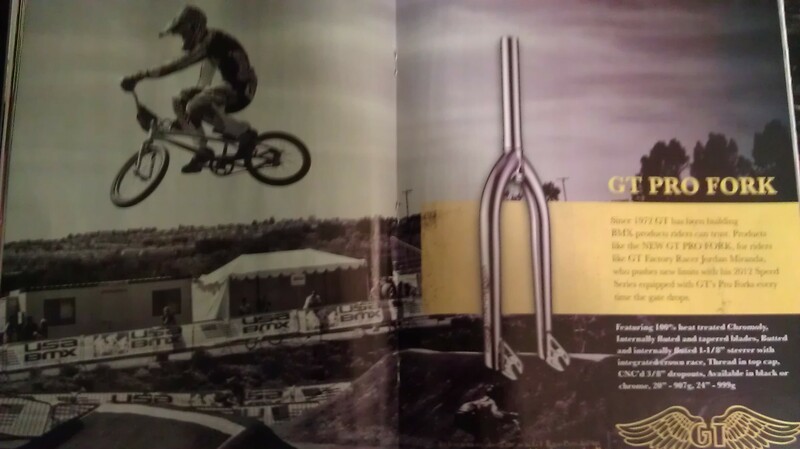 Flip to the center-spread and you’ll find a two-page ad for chromoly forks…. It’s like 1987 all over again! With month after month of ads featuring the latest and greatest carbon-fiber wonder fork, seeing an ad — a two-page one at that — for a chromoly fork seems quite out of the ordinary (but in my mind, definitely a refreshing change). Then check out the back cover. 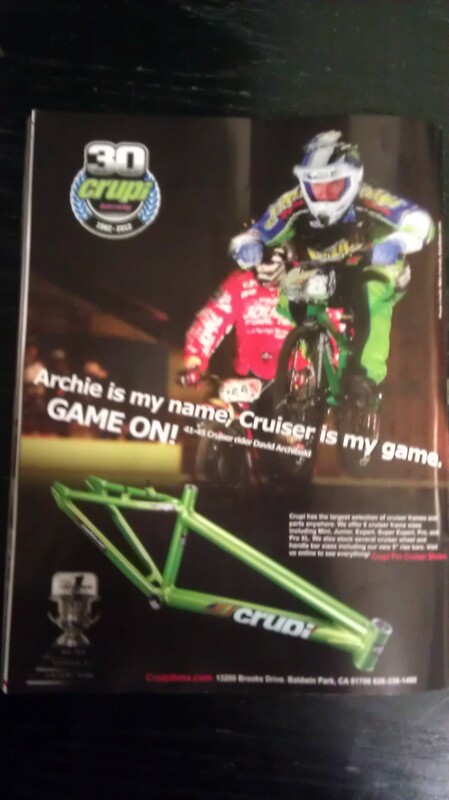 A Crupi ad featuring cruiser speed demon David Archibald promoting their cruiser lineup. Seems like it was just yesterday that BMX Plus! ran an article talking about “The Death of the 24”. Now here we are, just a couple of years later and a major race company is buying up prime ad space to promote “the largest selection of cruiser frames and parts anywhere.” Seems like the rumors of the 24’s demise were greatly exaggerated…and the popularity of cruisers are just as strong as they ever were. The longer I stay in this BMX game, the more I see things come and go…and then come back again. Anybody else have the same experience?